Clara is a quarter angel, having a half-angel mother and a human father. The only real trouble she's had up until now was her father leaving them, everything else has always come to her easily. But it was a bit of an adjustment learning that she was in fact not human. And could sprout wings, which is pretty awesome and scary at the same time. When she gets her purpose in a vision she, her mother and her brother move town because the boy she sees in her vision lives there. Every angel-blood gets a purpose at some point in life, a sort of test. But her mother is sort of Fight Club about the whole angel-blood thing: she doesn't like to talk about it and because of this Clara feels a bit clueless about everything. The boy in her vision turns out to be a boy at her school: Christian, and Clara develops a major crush on him. Too bad he already has a girlfriend. And then there's Tucker, her new friend's twin brother. A boy who calls her names and teases her mercilessly. When the moment comes to fulfill her purpose, what will Clara do and will she be ready for it? Clara is such a relatable 16-year-old. She's really struggling with being angel-blood and not having all the information is frustrating to her. She's also used to fitting in at school and has a hard time adjusting to her new environment, where things don't go as smoothly for her as before. She hates having to dye her hair because of her angelness shining through it, and worse when it turns out orange. Which earns her the nickname of 'Carrots' from Tucker, who is just adorable. I mean, I totally liked Christian, but Tucker stole my heart. He's that boy from highschool you either know or used to know, who may not be the most beautiful boy around, but has a great heart. Christian is the perfect guy, except that he has a girlfriend he genuinely seems to care about. Which is fine, but not if you're rooting for Clara. And I was rooting for Clara, I wanted good things to happen for her. I really connected with her and cried over the romance parts. She's actually a pretty strong girl, even if she doesn't know it herself. The concept of people who are partly angel walking around everywhere is really interesting and I thought it was really well played out by the author. There are rules, of course, and not everything comes instantly to them, which was nice. I hope that in the next book we'll learn more about the whole system and I'd love to meet a fullblooded angel. I really enjoyed this book, I was a bit wary of a story about angels, since Halo was such a disappointment for me, but I'm so glad I didn't let it put me off this one! 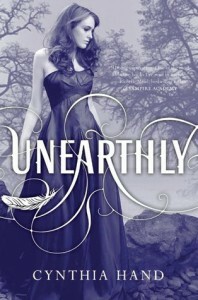 The writing was really engaging and I found myself gaping at the end: I have to wait until 2012 for the next book??? That is going to be a LOOONG wait..